As much as I love living in small-town, rural America, there are times I envy those living the life in suburban America, where everything is right at your fingertips. So many options. So many offerings. So much to do. So much to see. So much of EVERYTHING! Yes, including traffic, which is the main reason I don’t mind living in my nice little town! And don’t get me wrong, most of the time I can find what I need right here in my little town of Alexandria, population 13,000+. But, there are other times where the options and offerings are so much more in bigger cities. Anyway, it turned out the collaboration wouldn’t work because I don’t live in a big enough city. See, sometimes, bigger cities DO have some perks! However, because I think ClassPass is a pretty cool idea, I let her know I would let my readers know what ClassPass is all about. So, for those of you who live in bigger cities – specifically the Twin Cities metro area – where ClassPass is now offered, this is for you! I should first note that I was not paid to write about this. Well, I am getting a FREE water bottle out of the deal! I am sharing this information because I want to, not because of the free water bottle! I truly think ClassPass is an awesome and cool concept because it allows fitness class enthusiasts a chance to experience numerous fitness classes and numerous fitness studios without having to have numerous memberships. Truly, now that I am into taking fitness classes, I am kind of jealous that I don’t live in the Twin Cities metro area! I would totally take advantage of ClassPass! Okay, so really, what is ClassPass? With ClassPass, fitness class enthusiasts get UNLIMITED monthly classes at various fitness studios. You can take as many classes as you want, whenever you want, as in participating studios that is! Yes, of course, there is a fee, but there is no commitment. You don’t have to have an actual membership at each fitness studio/club/gym to take advantage of the classes. You just pay the monthly ClassPass fee and BAM! you get to take as many classes as you want! For instance, in the Twin Cities metro area, a variety of classes are offered at many participating locations including but not limited to Pure Barre, Revolution Cycle + Fitness Studio, Solidcore MSP, Six Degrees Uptown, TIGER FIT, The Shed, Pilates ProWorks and so many others. If you want to take a class Monday morning at Pure Barre, but want to take another at Pilates ProWorks that evening, you can. Think about it. If the fitness center you belong to only has yoga at times when you can’t attend, you would be pretty bummed. Especially if you are a yoga enthusiast. Or what happens if you want to take a Zumba class, but your fitness center doesn’t even offer it. Or what happens if you want to see what barre classes are all about or spin or pilates or PiYo or whatever, but again your fitness center doesn’t offer it? However, the one down the street does. That’s where ClassPass comes in. You CAN try these classes and with numerous fitness centers on board, you should find one that fits YOUR schedule! One little stipulation is that you can only visit the same studio up to three times per month. You can take as many classes as you want to take each month, but the idea behind ClassPass is that you share the love with ALL the fitness studios! If you have more questions, you can visit the frequently asked question (FAQ) page HERE. Everything is explained really well there, so check it out. Also, for those living in the metro area, because ClassPass has been so popular in other big cities and because it is the beginning of a new year, there could be a wait-list to join. But, ClassPass has provided me with a link for those in the Twin Cities metro area to use so that you can skip the wait list and join automatically. 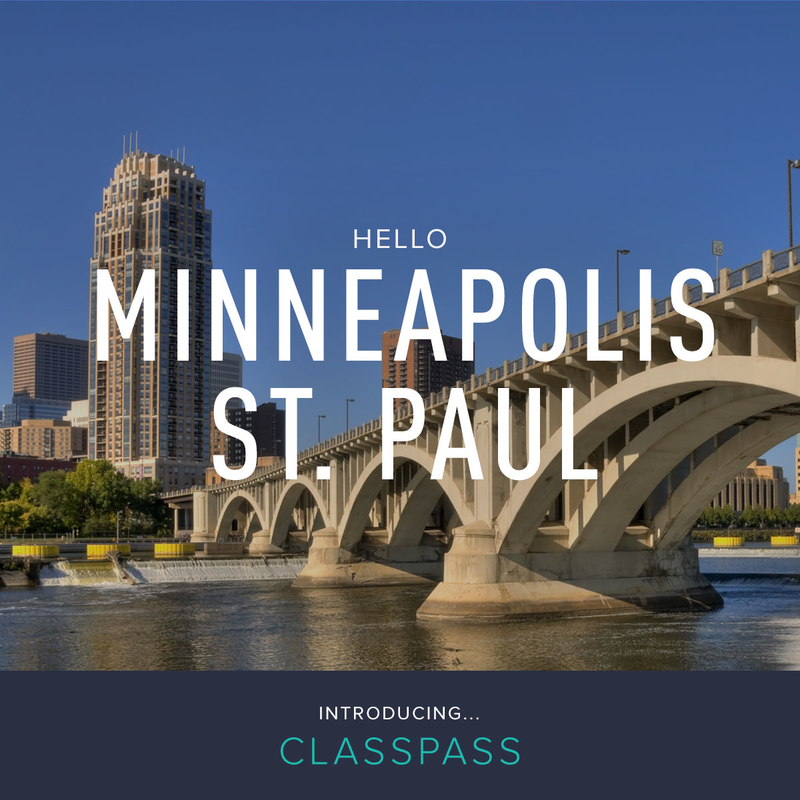 So, my Minneapolis and St. Paul readers, if you are ready to join ClassPass click HERE. You’ll skip the wait list! Oh, by the way, the fee for joining in the Minneapolis/St. Paul area is only $79 per month! The fee to join ClassPass runs from $79 to $99 per month depending on area. Twin Cities metro area residents, this is a deal! ClassPass is currently offered in 20 areas throughout the United States, including (in no particular order), New York, Los Angeles, San Francisco, Chicago, Miami, Boston, Washington D.C., Seattle, Atlanta, Austin, Charlotte, Columbus, Dallas/Fort Worth, Denver, Houston, Philadelphia, Phoenix, Portland, San Diego and now, Minneapolis/St. Paul! You can find ClassPass at its website HERE; on Instagram HERE; on Pinterest HERE; and on Twitter HERE. You can also download the app for iPhone HERE. What a cool concept. I too wish they were in my area. I signed up a couple weeks ago in the Twin Cities!! SolidCore was SUPER hard, “can’t” wait to go back! Vital Fit could be part of the list? Many people come up from the cities in the summer and could visit Vital? would love to have that option!!! Next Next post: Feeling honored and appreciated!